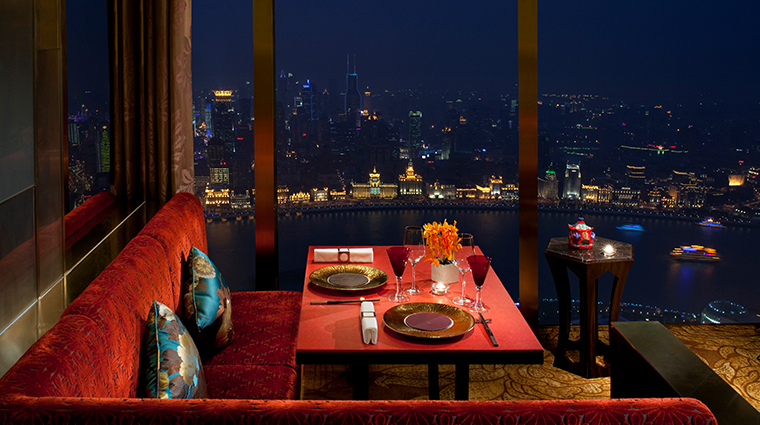 The Ritz-Carlton Shanghai, Pudong’s Jin Xuan Chinese Restaurant commands an impressive view of the Lujiazui business district’s skyscraper forest. 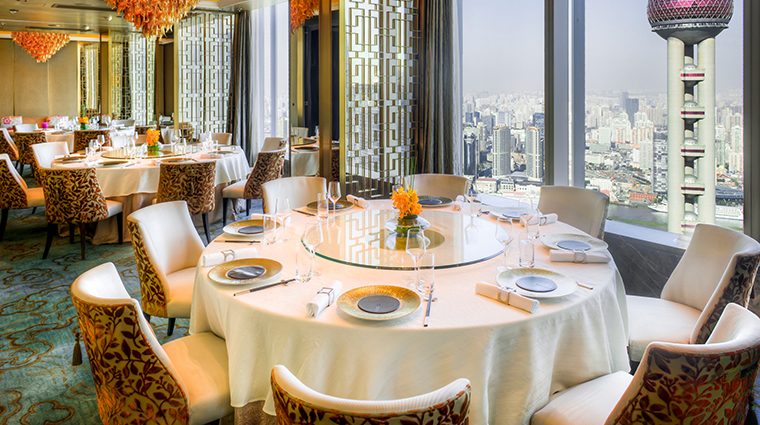 Its location on the 53rd floor of the Shanghai International Finance Centre, which also houses a luxury mall and office towers, makes it a favorite for local businessmen and women hungering for an elevated Chinese lunch option. It’s easy to imagine important deals being struck over delicate Cantonese dishes served on crisp, white tablecloths. Jin Xuan masterfully presents its local delicacies in a fine-dining atmosphere, offering uncompromisingly delicate traditional flavor combinations in an environment both overtly Chinese, but also undeniably stylish to the Western eye. 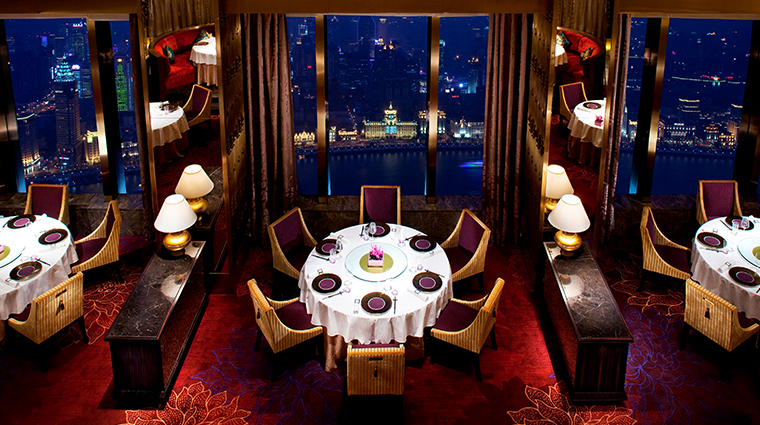 Also pleasing to the eye are the views — the restaurant’s high perch gives you a glittering glimpse of the Bund and the Pudong skyline. 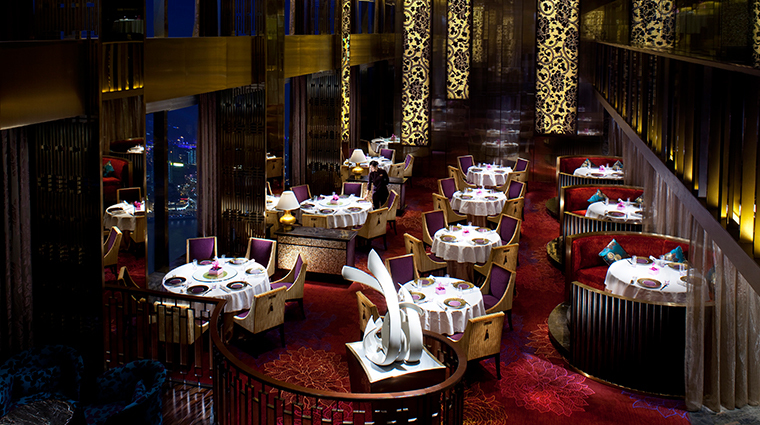 The menu is unmistakably Cantonese, but with chef Daniel Wong’s modern spin. You’ll find time-honored flavors combined with textural experimentation and Instagram-friendly presentation (like the deep-fried turnip puffs elaborately molded into swan form) to create a unique dining experience. The service is so unobtrusive at Jin Xuan that it’s easy to miss servers as they discreetly lay out plate after plate, family-style, in the middle of the expansive round tables. 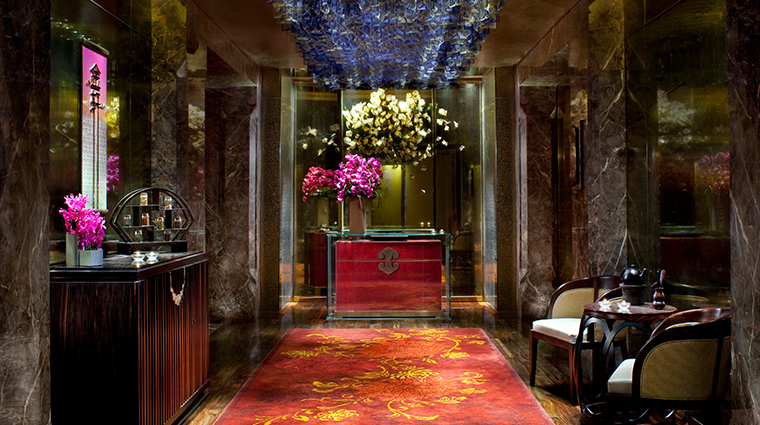 The mix of modernity and tradition on show at the Shanghai restaurant treads a fine balance, but a successful one. The flavors are classic, the presentation is contemporary and the décor has elements of traditional Chinese sumptuousness, executed with unfussy clean lines. The tea menu at Jin Xuan is as extensive as some wine lists, with longjing varietals from nearby Zhejiang province proving a particularly fine match for a dim sum lunch. The Cantonese-style roasted duck, as opposed to its Peking counterpart, is customarily eaten meat and skin together in bite-sized pieces. Usually, this means the skin of the duck is a bit limp (though, obviously, still very tasty), but Jin Xuan’s version comes with a miraculously crispy skin, one of the best of its kind in Shanghai. A popular destination for the workday lunch crowd, Jin Xuan is looking to add a special weekend dim sum menu. Given the quality of the staples offered on weekdays, it’s a fair bet that this Cantonese restaurant will quickly become a brunch hot spot. A small but noticeable perk of this fine-dining spot is the amount of space between tables. Providing far more wiggle room than the average Chinese restaurant, Jin Xuan allows you to enjoy quiet conversation with your dining companions, even in the center of the bustling main dining room. On a clear day, though it might seem like a good idea to request a table by the floor-to-ceiling windows to take advantage of the impressive city views, the larger booth-style tables on an elevated platform provide an unimpeded vista, and a more comfortable seat. The dress code at Jin Xuan is smart casual. Men should refrain from wearing sleeveless shirts or shorts, and flip-flops and sandals are prohibited. You won’t want to miss chef Wong’s crispy cereal lobster dish. A flavorful sweet milk powder “cereal” covers delicate morsels of lobster, all housed in a bowl of crispy pastry — it’s sweet and savory, hard and soft, and totally delicious. Jin Xuan’s menu is speckled with the gourmet ingredients — think abalone, bird’s nest, wagyu beef and lobster — expected of such posh places, but with the complement of Wong’s signature XO sauce. For a healthier option, look to the list of soups made with ingredients popularly used in traditional Chinese medicine and delicate vegetables found only in China’s verdant south, like Yunnan’s famed mushrooms. The design, from Hong Kong’s Steve Leung, balances warmth (lush red carpets) with opulence (gilded surfaces as far as the eye can see) to create a supremely sumptuous dining space. Vaulted ceilings add to the main dining room’s sense of spaciousness. Even though the venue seats 52, it feels like a private lounge. 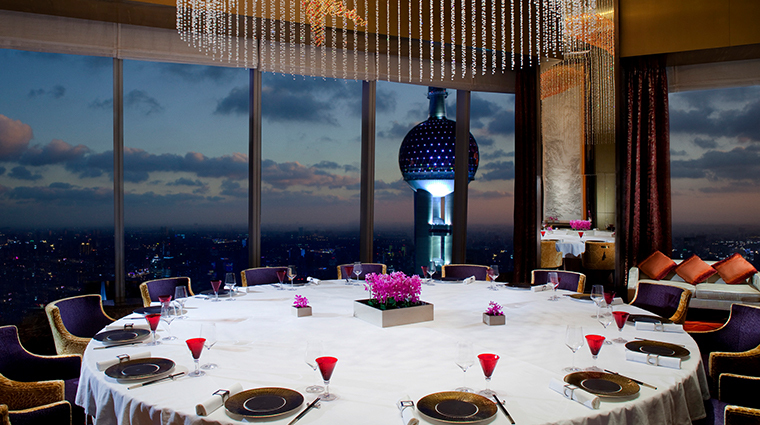 A wall of windows not only provides stunning vistas of the city’s iconic buildings, such as the Pearl Tower, but also allows for plenty of natural light, which gives more warmth to the main dining area.